Wassily Kandinsky was born on December 16, 1866, in Moscow, Russia. His father was a tea merchant and his mother was a homemaker. At an early age, Wassily exhibited a very special gift called synaesthesia cognate. This gift gave him the ability to hear colors and see sounds. This special gift was encouraged by his father who enrolled him in private drawing lessons as well as lessons in piano and cello. Between 1886 and 1892 Kandinsky studied law and economics at the University of Moscow. In 1889 he and a team studied the life of the people in the Vologda district in northwestern Russia. He was impressed by their folk art and the interior decorations of the village houses. Their art influenced his early style. In 1893 he accepted a law faculty position at the University of Moscow. Three years later, when Kandinsky was thirty years old, he decided to become an artist. He left his promising career in law to attend art school in Munich, Germany. His art was greatly influenced by an exhibition of French impressionist artists. The Impressionists used color and light to show their subjects rather than painting in fine detail. The works of Claude Monet interested Kandinsky very much. Subject matter played a secondary role to color in his paintings, and reality and fairy tale seemed to blend together. This approach would influence Kandinsky's work for the rest of his life. In 1901 Kandinsky founded the "Falanga" artistic movement and school where he shared his ideas about art. 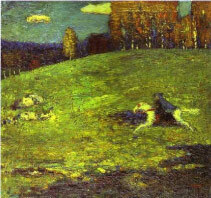 His paintings from that period, like The Blue Rider (1903), show his use of color to express an emotional experience rather than reflect nature. By 1913 Kandinsky was producing the some of the first completely abstract (non-representational) compositions in the history of art. They made no reference to the natural world and were inspired by pieces of music such as Composition VII (1913). 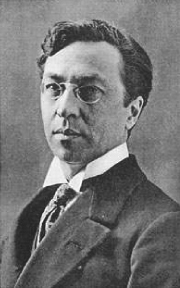 In 1914 Kandinsky returned to Russia. Two years later he married Nina Andreevskaia, the daughter of a Czarist colonel. From 1918 to 1921, he devoted much of his time to painting and teaching color analysis. Between 1922 and 1933, geometrical elements became increasingly important to Kandinsky - particularly circles, half-circles, the angle, straight lines and curves. One of his first works to include these geometric shapes was On White II (1923). When Nazis closed the Bauhaus school in 1933, Kandinsky moved to France. He remained there for the rest of his life. 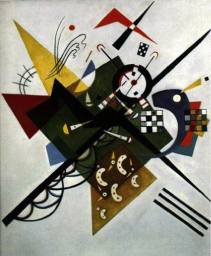 Wassily Kandinsky died on December 13, 1944, in his studio in Neuilly-sur-Seine, France. He is recognized today as the pioneer of abstract art. His non-representational paintings paved the way for the development of the Abstract Expressionist movement that dominated American painting after World War II. The Blue Rider (Der Blaue Reiter), for which this work was named, was the name of a group of German Expressionist artists of which Kandinsky was a member. Kandinsky used color to represent more than just shapes and figures. In this work white is life. The colors and shapes the possibilities the life has to offer.